Aaron and I spent the weekend in Agate, Colorado at the Skyline Brittany’s hunting tests. This is one of our absolute favorite things to do–run our dogs in AKC hunting tests and cheer our fellow exhibitors on. Why do we so enjoy AKC hunting tests? Because of the strong sense of community and the camaraderie that can be found at these events. AKC hunting tests are the perfect place for new people to get involved because they’re non-competitive events. Testing dogs are judged against a standard and NOT against each other. This means all dogs entered can qualify (not “win” because they aren’t competing for points). Take this past weekend as an example. 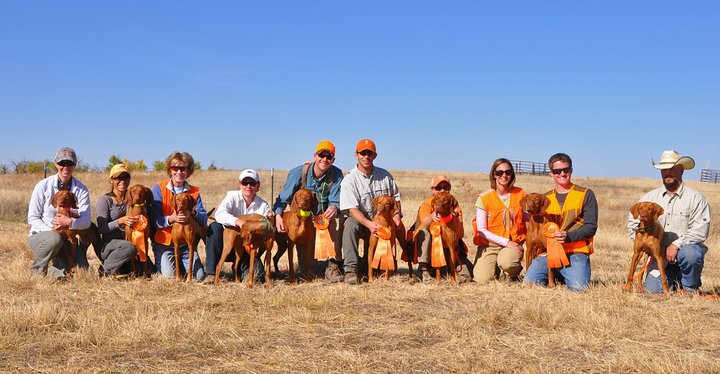 We were so proud of fellow “newbie” club members (The Rocky Mountain Vizsla Club) for diving in and entering these tests. With the encouragement from more experienced exhibitors, the newbie exhibitors felt they could do it. And they did!! Their dogs qualified in the Junior Hunter level! All of those joyful smiles reminded me of when Aaron and I were newbies too. How special that first ribbon is!! A memory to be forever cherished. Our start was very different though. We didn’t have mentors to ask questions of or to encourage us. Perhaps this is why we believe so strongly in “paying it forward”. We work very hard to encourage our own puppy homes as well as new club members to come out and learn about AKC events: conformation (dog shows), hunting tests, field trials, rally, obedience, agility. We hope other seasoned exhibitors “pay it forward” as well because without the newbies, these games we so enjoy playing will not survive. The newbies are the future. They are the future workers, the future exhibitors, and the future judges. We hope, by teaching and encouraging new exhibitors, they’ll in turn become the seasoned ones who will someday, take a newbie under their wing and…pay it forward!